In Bodrum, Summer House With Pool, Near The Amazing Beach. New! Located in Karaincir/Akyarlar, near the best sandy beach of Bodrum. 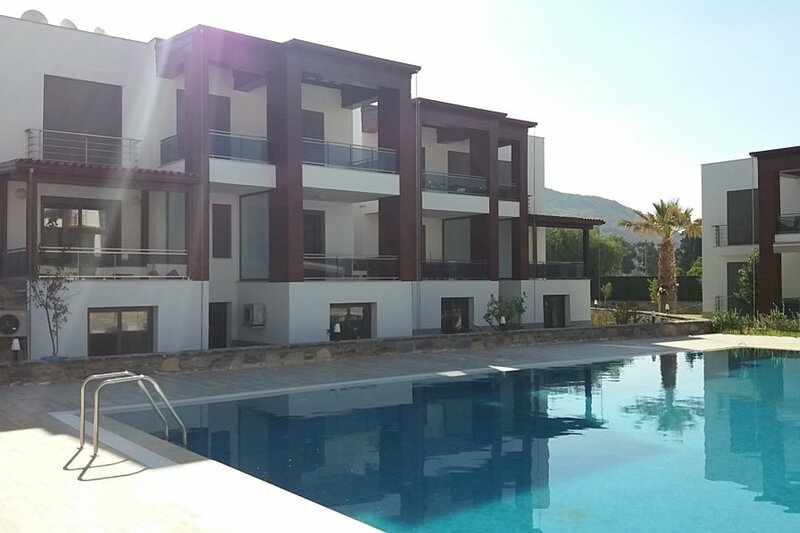 A new duplex apartment in the complex with swimming pool, security and car park. Has a bus stop and a supermarket near the house. July and August 2018 have been rented. Other months are available during the year. The house is located in one of the best parts of Bodrum Peninsula and it is 23 km. to Bodrum city center. Bus stop is just 30 meters to the house and buses to Turgutreis and Bodrum depart in every 10 minutes. The houses were newly buit in 2017. Security and car park are also available. It is with full furniture, kitchenware and beddings. First Floor: Living room, kitchen, WC and terrace (with pool view). There is no sea view but it has its own beach near the Karaincir Beach. Besides, there are two beaches which are both 50 meters to the house: Karaincir Beach and the beach of a summer house complex just near the house, which is known as the best sandy beach in Bodrum. It is located just near the supermarket. Akyarlar is a small village which is also near the sea and 2.5 km. to the house. There is also a local food market on every Saturday in Akyarlar. There are many restaurants available near the house.